Lawrence Park Tennis Club offers a variety of competitive activities held over the course of the summer. For those who enjoy competitive play, we have League Teams – in the Inter-County League, Toronto Ladies’ Tennis League and North York Tennis League – which play against other clubs in the community. These teams are for players at the intermediate to advanced level. For players at all levels who prefer more recreational and social tennis with a hint of competitiveness, we run House League Monday nights from 7pm – 10pm from May to August (pre-registration is required). House League is a great way to meet other members and find new hitting partners. And every September, members come out to the courts to play in (or cheer on) our Club Championships. LPTC has a long history in competitive community tennis with league teams in InterCounty Mixed A, C and 55+, and Ladies’ teams at the A, and B level. Additionally Juniors compete through the summer junior league. House League starts in May and runs every Monday, 7pm – 10pm, until the end of August. It is very popular with our Adult members and requires registration in April. Members are encouraged to come out for some social summer doubles. Bragging rights go to the members who win the Mens’ and Ladies’ Singles, Doubles and Mixed club championship at the end of the season. The tournament is held in September and provides an opportunity for some final fun competition. New in 2018, we offered a fabulously successful ladder… Members are encouraged to join for the season. Click here for more details! 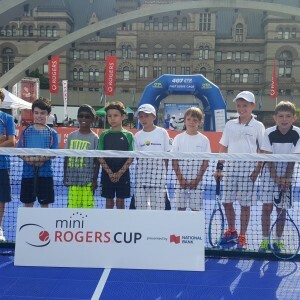 Congratulations to our Junior Team players, the ‘Lawrence Park Lightening’ who won regionally and played in the FINALS in Nathan Phillip Square. Click here for more pictures! For more information regarding any of these activities, please contact our Games Director at Games@LawrenceParkTennisClub.ca.